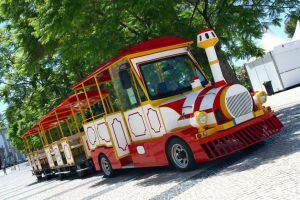 A sightseeing train in St. Augustine Florida was involved in an automobile crash, when a vehicle in front of it started to make a left turn then stopped. The driver of the trolley car tried to brake; however it had been raining, and the train struck a vehicle traveling in the opposite direction. The train had two carriages, which turned sharply in the collision. A ten year old girl was thrown from the train and suffered injuries to her arm. An eighty year old man was taken to the hospital due to lower back pain. Thankfully, it appears that there were no other personal injuries from the auto accident. The driver of the train was cited for careless driving. If you are involved in an accident causing personal injury, please feel free to contact our Jacksonville personal injury attorneys for a free consultation.